with a 12.1" LCD and integrated optical drive. Runs for approx. 8 hours*4 on standard battery power. Passed a 76 cm free fall test *5 and a 100-kgf pressurized vibration test*6. Integrated wireless LAN(IEEE802.11a/b/g), IEEE802.11n (Draft 2.0) and Bluetooth(R). *WWAN mode is also available. 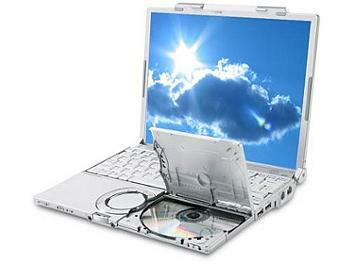 The cover opens upward, making it possible to insert and remove discs without requiring much space. Laser printing has improved the durability of the characters printed on the key tops.